10. Lisbeth Sander (“The Girl with the Dragon Tattoo”) – Just one of the wildest protagonists ever created. Brilliant, scarred, compassionate, ruthless. Made me want to start reading novels again after years of being a “non-fiction only” person. 9. 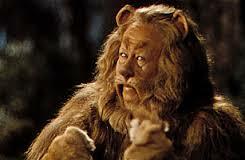 Cowardly Lion (“Wizard of Oz”) – I never missed watching this movie on TV when I was a kid. It came on every year about Easter time. The flying monkeys scared the hell out of me, but Burt Lahr as the Cowardly Lion (“Put ‘em up, put ‘em up!”) made me laugh every time. 8. Viola (“12th Night”) – How can you have a “literary favorites” list without a Shakespearian character? And Viola – the stranded stowaway from “12th Night” – tops mine. I saw the play most recently in an open air theatre in Spring Grove, Wis., – and I’m ready for a return trip to that venue this summer. 7. Doc Ricketts (“Cannery Row”) – I grew up in Steinbeck country and spent lots of time on Cannery Row. I just felt a connection to Doc and the cast of woebegone characters in that novel. I read it for the first time when I was about 21 years old and writing this reminds me that it’s about time for a re-read. 6. Jeeves (P.G. Wodehouse) – Professor Maurie McCutcheon of the University of the Pacific taught a class entitled “Literary Humor” during my sophomore year. He was the perfect instructor for one of the funniest writers (Wodehouse) and one of the most hysterical characters (Jeeves) of all time. Thank God for the British. 5. Bullwinkle (“Rocky and Bullwinkle”) – When I was a kid, Bullwinkle was broadcast on Sunday mornings after Mass. I would make my mom race home so I could watch it. Ten bonus points for anyone who can name Bullwinkle’s home town and his alma mater. Twenty bonus points to anyone who sends me a T-shirt with the school’s name on it! 4. Holden Caufield (“Catcher in the Rye”) – Salinger rocked my world when I first read this book in 1974 and still does so today. ‘Nuf said. 3. George and Lenny (“Of Mice and Men”) – I know, I know, more Steinbeck characters. But I can’t leave them off my list and you can’t have George without Lenny. “Tell me again, George, about the land of milk and honey.” Touching, moving, sad, inspiring. 2. Atticus Finch (“To Kill a Mockingbird”) – I loved the character in the book (also read for the first time at about 17 years old) and Gregory Peck’s portrayal in the movie goes down as one of my favorite all time performances. Atticus represents the hope that we can be the person we aspire to be, even if we sometimes fall short. Recently saw To Kill a Mockingbird (again). As moving as the first time I saw it. Would highly recommend Josh Wedon’s Much Ado about Nothing that’s available on now Netflix streaming. Modern setting, wonderfully done. Actors you will recognize. 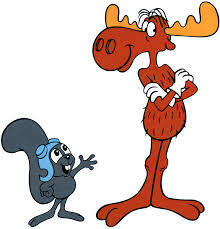 Rocky and Bullwinkle live in the town of Frostbite Falls, Minnesota. The population of Frostbite Falls is variously given as 23, 48, 29, 31.5 and 4001 over the course of the series. Bullwinkle is originally from the state is Moosylvania, a small island in the Lake of the Woods, and is actually its governor. Wow, that’s even more detail than this Bullwinkle fan knew! The Bullwinkle answers are Frostbite Falls, MN and Wassamotta U. I wish I could have chimed in on some literary master piece but cartoons were my specialty. As an Italian, you’d think I’d be offended by the school name, but it’s so funny I can’t be! 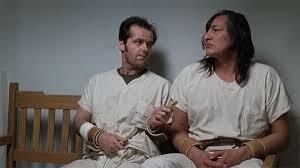 Andy Dufresne from Shawshank Redemption for perseverance and lesson to be optimistic when thing get tough. The name is Christmas. Lloyd Christmas. If you like P.G. Wodehouse, then you might want to check out “Three Men in a Boat” by Jerome K. Jerome. Published in 1889 – laugh-out-loud funny! Other recommendations: Anything by Bill Bryson (in particular, (1) One Summer (2) At Home and (3) In a Sunburned Country). Finally: Devil in the White City by Erik Larson – Non-fiction – Fascinating account of both the Chicago’s World’s Fair and a serial killer. All great reads and perfect for summer!